Staging Diva in the News, Internationally! Staging Diva In The News… Internationally! Honestly I couldn’t afford to buy this kind of coverage! I was also featured in the August issue of Michiana House and Home Magazine. The reporter used some content from one of my websites and called for permission and a direct quote to add to her story. What these two examples share in common is that the media came to me, and they found me online. Before you assume this is because I’m somehow famous and this can’t happen to you, let me assure you it isn’t true because I have been getting media attention almost from the beginning! 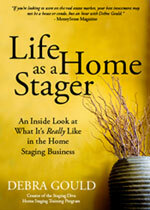 Plus, I had only been a home stager for 2 years when both the Wall Street Journal and CNNMoney called me. You can learn how I did this so you can get coverage too. In my 5 tips article, scroll down to the comment section and you’ll discover how Staging Diva Graduates are successfully using what I teach them!